The three-day demonstrations took place across two cities, and the trials involved around a dozen vehicles, three of which were conventional cars and the rest were driverless pods, currently finding a market in large facilities, such as airports, logistics centres and campuses. The £20 million project adds that this trial will provide valuable data on the road to bringing the technology to the mass market. “UK Autodrive has been a hugely successful project that was delivered on time and on budget,” said Arup’s Tim Armitage, UK Autodrive project director. “Taking place in Milton Keynes, Coventry, and on the Horiba MIRA test track, UK Autodrive carried out a series of trials of increasing complexity which have demonstrated the functionality and potential of connected and self-driving cars. 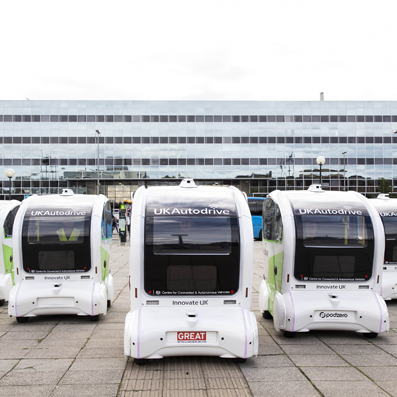 “The programme also delivered a fleet of lightweight, autonomous ‘pods’ which have been designed to operate last-mile services in an urban environment. The pods have demonstrated how they could be used to provide a public transport service to residents of Milton Keynes. Jesse Norman, future of mobility minister, said: “The increasing automation of our cars is transforming the way we drive, and the government is providing the regulation and investment in order to prepare for the future. “Automation could bring significant benefits to people right across the country and presents enormous economic opportunities for the UK, with the global market for CAV [connected and autonomous vehicle] technologies expected to be worth over £900 million by 2035. Interested observers have expressed some concerns about where all this technology will lead to. Dr Markus Burianski, partner, White & Case, said: “The three-year UK government funded project has no doubt delivered some great results for the companies involved. “But just as with all new technologies in development, there are a multitude of novel issues that need to be clarified with driverless cars. “Companies must develop a strategy to limit their liability and product monitoring obligations at an international level. “This could be achieved, for example, by separating hardware (for example, the car) and software (for example, “autonomous driving” as a separate service). “In addition, companies will also have to optimise their organization and documentation to be able to respond as fast as possible whenever defects or safety vulnerabilities emerge, and to avoid any liability on the part of the company management.